The investigation of a political corruption case known as ““Gürtel” has revealed more serious facts like the alleged under the table salaries given to some members of the Popular Party (PP) leadership [es], which currently rules Spain [“under the table” means an illegal salary that is not officially informed or regulated]. The former treasurer of the PP, Luis Bárcenas, who up until a couple of weeks ago still had an office at the party's headquarters and was backed up by the leaders, is now being investigated for having a Swiss account with 22 million euros and for paying bonus salaries under the table [es] during long periods of time to important public offices. It could turn out to be the most important corruption case in all Spanish history, and in spite of that, the implicated have denied all accusations, bragged about having transparent accounts, and are still asking the people to “adjust their budgets” due to the current crisis. To regain the citizens’ trust and prove their innocence, members of the party have offered solutions like an internal audit and sworn income declarations [es] which have angered everyone even more. Map of the political corruption in Spain. By Corruptódromo. Used under CC BY-SA. Since the newspaper El País leaked secret documents [es] that proved the illegal financing of the PP, social media have become the support system for the popular outcry. An online petition at Change.org, which is still running, managed to receive 100,000 signatures in 10 hours [es] asking for the resignation of the Spanish government. Also, an initiative called the Spanish people to publish thousands of comments with envelope drawings (the money was supposedly handed out in envelopes) on the party's Facebook wall [es]. The party's communication department was not able to erase them all. Humorous poster with a message convening a protest. Taken from Periodismo Humano under a CC License. 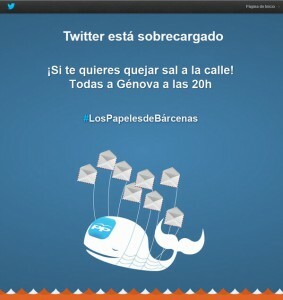 The hashtag #lospapelesdebárcenas (Barcena's papers) turned into a worldwide trending topic [es], as informed by several media. Also, other related hashtags about the case appeared on Twitter. For example, #pelisconbárcenas (movies with Bárcenas) opened the room for netizens to use their imagination and humor to comment the news using movies names in an attempt to highlight that reality exceeds fiction. Hashtag #DondeestaRajoy (where is Rajoy?) emerged as a way to denounce Mariano Rajoy's (Spain's President) silence because he hasn't made a statement on the case or on his possible involvement. 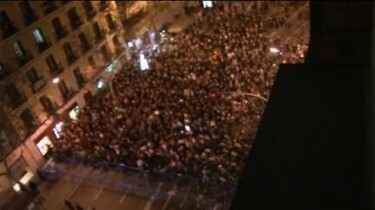 Airview of the sit-in infront of the Popular Party headquarters in Madrid. Picture by Periodismo Humano published under CC Licence. several netizens have pointed out that the government, and not the protesters, are the ones harming Spain's image overseas, in reference to an accusation made by the government. @LivingInGreen: When we protest, we damage the image of Spain. Not when the government's party steals. #lospapelesdeBárcenas see to believe. Some of you are right-wing and some of us are leftists. I hope that never changes: the tension among ideas and rigorous debate are the fundamental requirements for a society to move forward. But I think many of you would agree that the our rotten political system has reached its limit and that we can work together in this project.